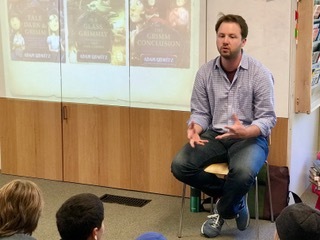 Adam Gidwitz, children’s book author, visited McGuffey’s Upper Unit last week. Gidwitz’s book, The Inquisitor’s Tale, is one of three Newbery Honor Books for 2017. 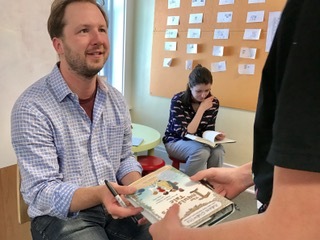 McGuffey Middle School students read and studied the book with Quentin ahead of Gidwitz’s visit and prepared questions to ask him. (Many students in Grades 4 and 5 chose to read the book as well.) Gidwitz gave a funny and insightful presentation that kept the Upper Unit students listening with rapt attention from beginning to end. Students really enjoyed the question and answer session that followed. Gidwitz also signed students’ books and stayed in the classroom for a while to chat with them individually. He was a Montessori student for some of his youth and said our classroom looked very familiar and comfortable. 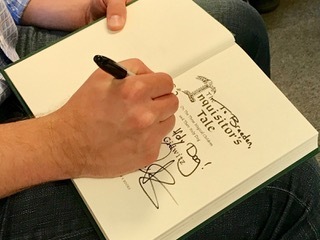 Many thanks to the Lane Library for arranging for each of our students to receive a copy of his book and sharing this special experience with us. This entry was posted in community, guest speakers, language arts, McGuffey, upper unit. Bookmark the permalink.